This bright and beautiful dining room features a fixture from one of our favorite lighting designers and manufacturers – Bocci. It is a 14.14 installation shot from Staffan Tollgard Design Group in London. 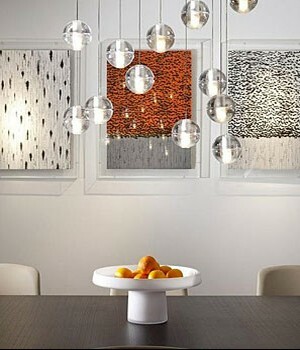 The fabulous Bocci light fixture of clear glass globes with the backdrop of contemporary colorful and textured art in clear glass frames is the focal point of the room. Pairing it with the simplicity of the table, solitary centerpiece with oranges and dark wood make for a natural, serene space design that captures the essence of Sensory Six.